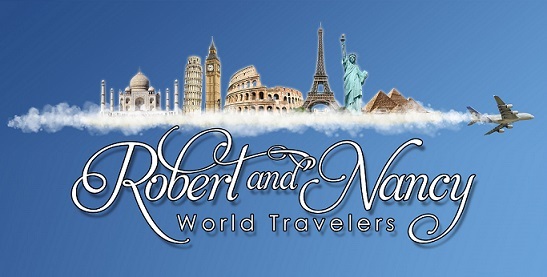 Day 1, January 4: After a long but uneventful flight, Robert, our friend Richard, and I arrived in Moscow. We had a little trouble getting into the apartment we rented because our host neglected to provide full information for the lock box, but we got it worked out in about a half hour. The apartment is fine - nice and warm, and quiet. Exhausted, we adjourned to our rooms and fell into bed. Day 2: We all slept a bit fitfully, waking early but not getting up until after 10:00. 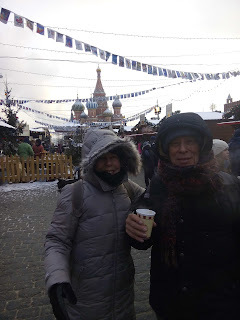 After coffee at a nearby cafe, we walked to Red Square, which is about a mile from our apartment. It was five degrees outside, but the coats we bought and all the layers underneath did a good job keeping us warm. Faces and hands got cold, but when it felt like too much, we ducked into the most incredible shopping mall adjacent to the square to warm up. The place was filled with elaborate holiday decorations, super high-end shops, and lots of people, many of whom were eating ice cream. Red square was beautiful, teeming with people - little kids in big, puffy jumpsuits, women in fancy boots and elaborate furs - celebrating the New Year. There were many brightly decorated kiosks serving coffees and all kinds of goodies and touristy trinkets. There was an ice rink filled with happy skaters, and people in elaborate traditional costumes served as delightful decoration, and all with the backdrop of the Kremlin and the extraordinary "onion" domes of the Cathedral of Saint Basil. Lenin's tomb is in the square too. We'll investigate those places another day. For me, this is the best time of year to see Moscow. I already feel a deep fondness for this place. The days are short here and if I remember correctly, sunrise occurs today at 8:49 and sunset at 4:15. But that's okay because all the New Year decorations and displays are full of beautiful, colored lights lending a magical quality to this place. I've heard that Russians enjoy the Winter Solstice and New Year so much that they keep it going throughout the month of January. Robert and Nancy in the Red Square. In the background is the St. Basil's Cathedral. Day 3: It's been snowing lightly off and on all day. The snow is granular, much more like fairy dust than flakes, and it sparkles like tiny diamonds in the light. We had scrambled eggs and a sweet Russian bread for breakfast, and after plotting our activities, set out for the day. We got tickets for a jazz concert at the Tchaikovsky Conservatory, which is just a few blocks down the street. From there, we walked to another theater for ballet tickets, but they were sold out. This is still the holiday season, and it seems people here have purchased their tickets way in advance. Only a bit disheartened, we walked further to the Tchaikovsky Concert Hall and got tickets for a piano concert featuring the music of Chopin and Liszt. Afterward, we had dinner at the Tchaikovsky Cafe next door. The food was delicious, and our waiter spoke fairly good English so we had some pleasant conversation. After, we walked back to our apartment, tired but happy we'd been able to procure tickets for something. As I write this now, it's not quite 8:00, but we're ready for bed.